Planning a great bachelor party? Paintball is a great way to start an epic bachelor weekend. What other activity gives you the opportunity gather up a bunch of lifelong friends and shoot them? That’s a package valued at $74, free for the bachelor! It’s just one way we work hard to provide a great bachelor party. As Minnesota’s oldest paintball field, we’ve hosted thousands of great bachelor parties, so we know a thing or two about planning an epic party. The key to planning the best bachelor party is finding activities that everyone in the party can enjoy. Golf may be a great way to spend an afternoon, but chances are there a couple of people in the party who don’t play golf. 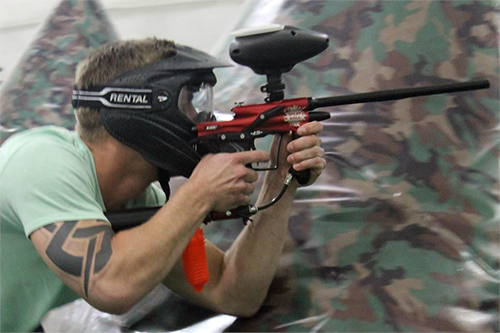 Unlike golf, paintball is an activity that’s easy to learn and doesn’t require any previous experience. If you know how to operate an Nerf gun, you already understand the basics of paintball. A great bachelor party doesn’t involve one destination or activity. A great bachelor party is typically a weekend of epic fun. Here’s our suggestion for a bachelor party in Minneapolis. Choose a hotel in downtown Minneapolis. This will be you base of operations, so you want a hotel that’s easy to get to and offers easy access to a cab or public transportation. We recommend Aloft. Aloft offers all the typical hotel amenities and also has a bar. The bar is a great place for your crew to congregate between activities. Plan your paintball activity for late afternoon or early evening. You’ll only need a couple of hours to play, so you’ll have time to grab dinner afterwards. Get cleaned up and change into some nice clothes, ready for a night on the town. Hire a taxi if you don’t have a designated driver. If you don’t want to take the time to head back to the hotel, consider renting jumpsuits at Splatball and changing into your nice clothes after playing paintball. There are tons of great restaurants in downtown Minneapolis. If you want to go out for the best steak in town, there’s no better steakhouse than Manny’s. If you’re looking for something more casual, check out Psycho Suzi’s Motor Lounge. There are plenty of great bars in downtown Minneapolis. You’ll find everything from the traditional bachelor party stops to classy nightclubs. Bottom line, there are far too many nightclubs in the Twin Cities for us to pick one. Fortunately our friends over at Twin Cities Nightclubs have all the info you need to pick one that’s right for your bachelor party.